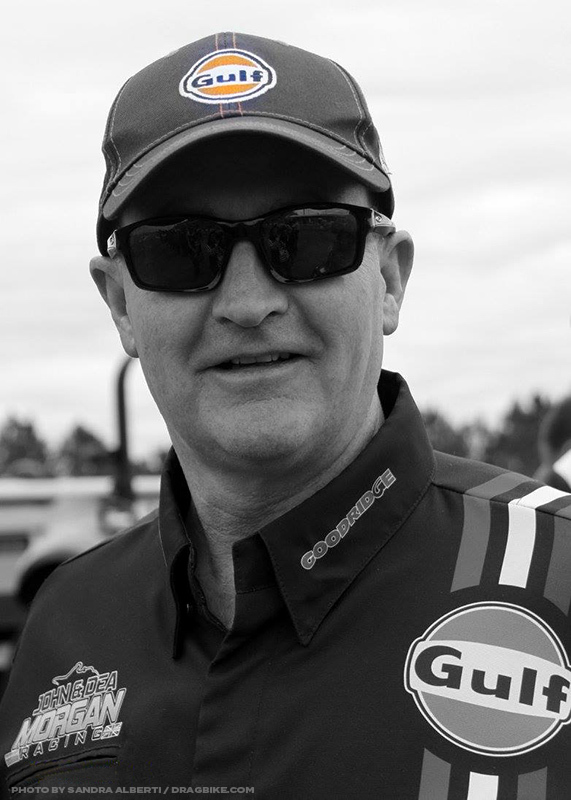 Some of the more usual questions we get from visitors to the Gulf Oil Drag Racing Team pit area during a race event are “how long does the engine last” or “do you have to rebuild it between every run like the Top Fuel cars?” It would seem that it is a commonly held belief that supercharged 4 Cylinder Top Fuel Bike engines such as our Puma Engineering power plant are hard on parts, requiring frequent part replacement and as a result, are expensive to run. I’d like to take you through our engine maintenance & repairs during 2018. 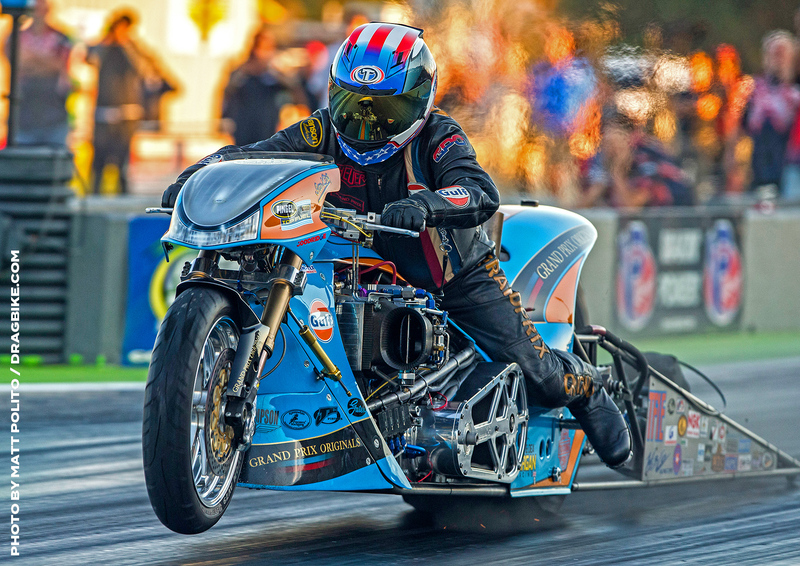 In this year we ran at the opening round of the ACU Drag Bike Championship, the entire FIM European Championship series, 6 runs `up the hill’ at the prestigious Goodwood Festival of Speed, a number of startups at the Harley Davidson 115th Anniversary World Rally in Prague and the MFC USA World Finals in Valdosta, Georgia. During this time our European Championship rider Filippos Papafilippou won his first and our team’s 11th FIM European Championship, his first 5 second pass (and numerous after) with a best of 5.78 seconds @ 240.29 mph and I also personally ran two five-second passes in eliminations on my way to reaching the final of the MFC USA World Finals. There is a commonly held belief that such performances and extreme running conditions would result in extensive engine damage and wear, and the need to have a number of exchange power-plants to hand to complete a race event. But our team consistently display that this is not necessary, only using one engine throughout the last 8 seasons due to the selection and use of optimal engine, components, and most importantly lubrication products in our ca. 1500 horsepower engine. The lubrication factor is the most significant, with adverse oiling conditions at the root of many premature engine failures. Oil is required between moving parts to not only to reduce friction but also to carry away heat and is the primary means by which the rod and main bearings are cooled, as well as the pistons. So any reduction in oil flow may cause these parts to run hot, gall and seize. Low oil pressure is also often a contributing factor in engine failures. 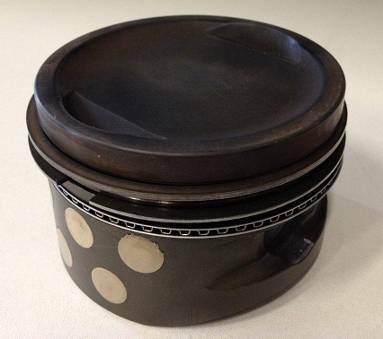 Although the underlying cause may be a worn oil pump and/or excessive clearances in the main and rod bearings as a result of wear or neglect (not changing the oil and filter often enough) poor selection of oil in a nitromethane powered machine is often the prime factor. 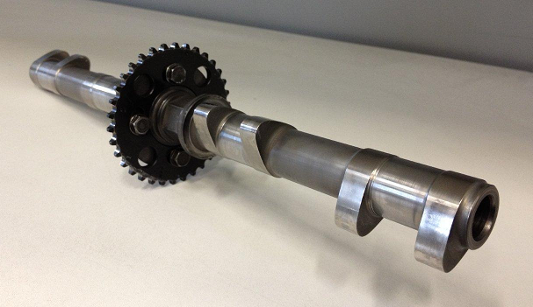 Our `modern’ overhead camshaft (OHC) engines are even more vulnerable to oil conditions than the typical push-rod engines used in nitromethane powered cars because the camshafts and valve train are further away from the pump. When an OHC engine is first started, it takes a while for oil pressure to reach the cam bearings so if the oil viscosity is too heavy (especially during cold weather) it may delay the arrival of oil long enough to starve and seize the camshafts. For this reason, high-quality multi-grade oils are more desirable in cooler weather conditions than the typical straight-weight oils traditionally used in pushrod car engines. An oil that is unable to alleviate `bore wash’ suffered by the extremely large fuel loads injected into the combustion chamber (around 14 gallons per minute @ 10,000 rpm in our 1585cc engine) will suffer dilution causing high friction and so overheating between the piston and cylinder sleeves resulting in the dreaded `black death’, a hard black residue forming on the cylinder walls. Following an extensive testing regime and long experience of various oils we have found that a product from Gulf Oil exhibits the best characteristics for our intense operating conditions. 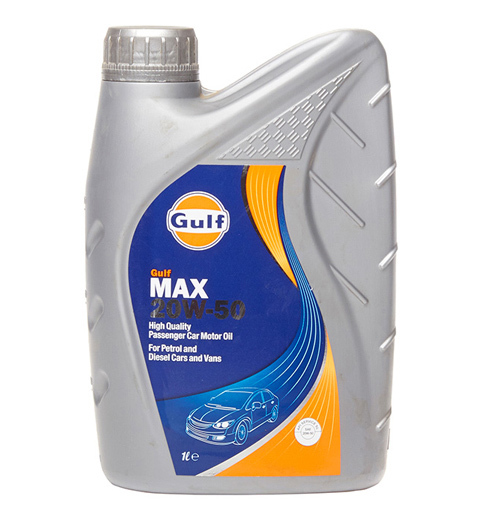 Amazingly this oil is not a specialist race item, but a standard passenger car product from their range, Gulf Max 20w50, available from any normal petrol station throughout their European network. The engine oil is replaced after each round. There are a number of reasons for doing so. First of all we look at the quality of drained oil. In particular we look for any metal particles (or other debris) as that may indicate that an internal mechanical part may be wearing or worse, about to fail. The other thing we look at is the total volume of liquid which is drained from the engine. We measure how much oil we put in and measure the total volume of fluid that comes out of the sump (pan), the dry sump tank and the breather & catch tanks. It is a fact that you always drain a higher volume of fluid compared to volume of oil put in, because the oil is diluted by the copious volumes of nitromethane fuel as aforementioned. Compared to other street or even petrol powered race vehicles, Top Fuel engines generally operate with larger piston to wall clearances and the amount of injected fuel per cycle is approx 4 times as much as those engines for a given capacity and RPM and explains the increased drained fluid volume. The total amount of diluted oil we drain, along with the Racepak datalogger info from the pan pressure sensor and the contents of the catch (breather) tank indicates the condition of our JE Pistons & rings. 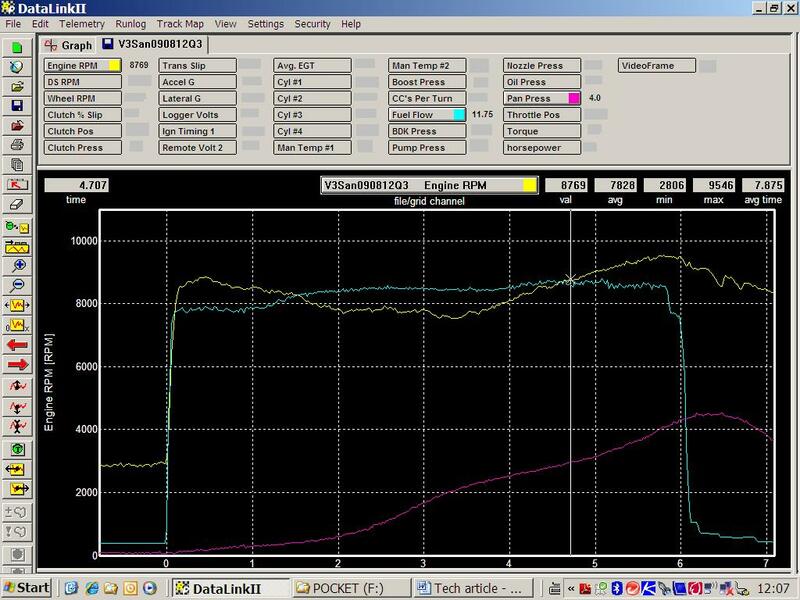 Datalogger screenshot showing engine rpm, fuel delivery to engine (GPM) & pan pressure (Psi). Upon analysis of a typical run you will notice the entire procedure from start up to reaching the end of the track lasts somewhere between 2 to 2.5 minutes. The burn out lasts around 2 seconds, however that is at low rpm with very little throttle opening (load). Less than 5.8 seconds of the run is under full power, but the majority is just idling. 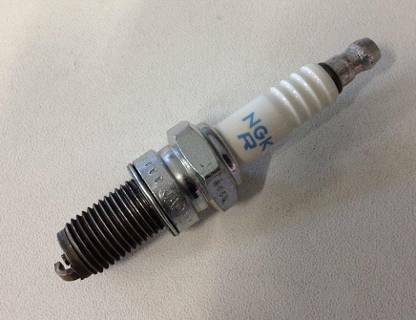 After each run we replace all eight NGK spark plugs (two spark plugs per cylinder). Not race plugs, just regular street bike/car plugs. Nitro driven engines tend to burn down the ground wire on a really good pass, but we do not experience this once during the entire season. However, we always replace them as a precaution. After each race we read the leak down figures and take our bespoke billet Puma 3V per cylinder (2 intakes and one exhaust valve) head off for closer inspection (irrespective of the leakdown figures). We take out the exhaust valves to give them a quick lap into the aluminium bronze hemispheric combustion chambers (know as `skulls’) but the Kibblewhite Nimonic valves hardly ever need any adjusting during the season. 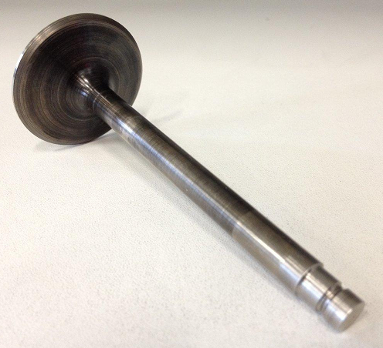 Exhaust valves are probably the most vulnerable part in any fuel engine, however, we never hurt one. Below you can see an in depth look into a section of one our valve shim records. 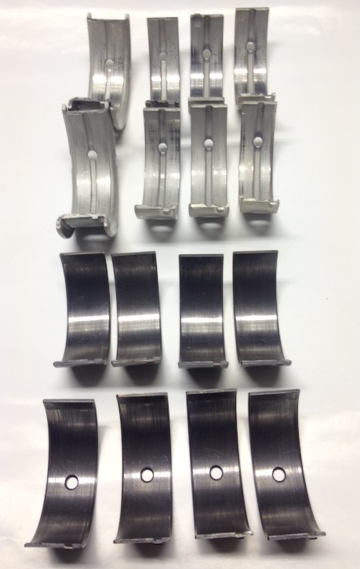 You can see how little the shim thickness varies from the start of the season to the end. None of the valves had to be replaced and adjustments were minimal. 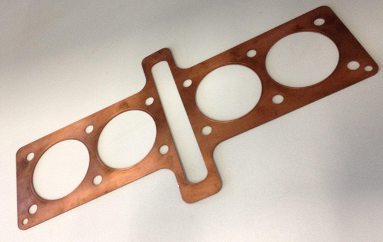 The traditional Cometic copper head gasket is annealed after each race and is re-used. We replaced the timing chain twice. Though our Web Cams and Kibblewhite valve springs are not really classified as `wild’, it is the extreme high combustion chamber pressures against which the exhaust valves have to open which puts the most stress on the timing chain. We replace the connecting rod shells halfway during the season, and race schedule permitting we may pull the entire engine apart and replace the main shells as well as low-cost items and as a precaution. Connecting rods are only replaced between seasons and again as a precaution. However, it is not uncommon that the bottom end stays together all season long. 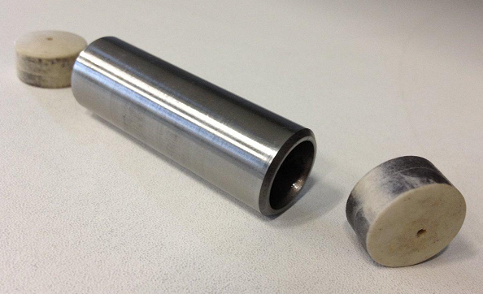 The picture here shows both the main and big end shell bearings after a number of races. They are almost as good as new, and if they were not so cheap to replace they could be put back into the engine for many more races. Their condition is a testament to the Gulf Oil quality, oiling system efficiency and safe tune. Other high stressed parts are the wrist pins and pistons. We replace the APE pins once during the entire season unnecessarily but as a precaution. Our JE Pistons last an entire season without the need to change, but again we refresh our engine with an all-new set usually mid-season as a precaution although the originals are often recycled for use in subsequent seasons. 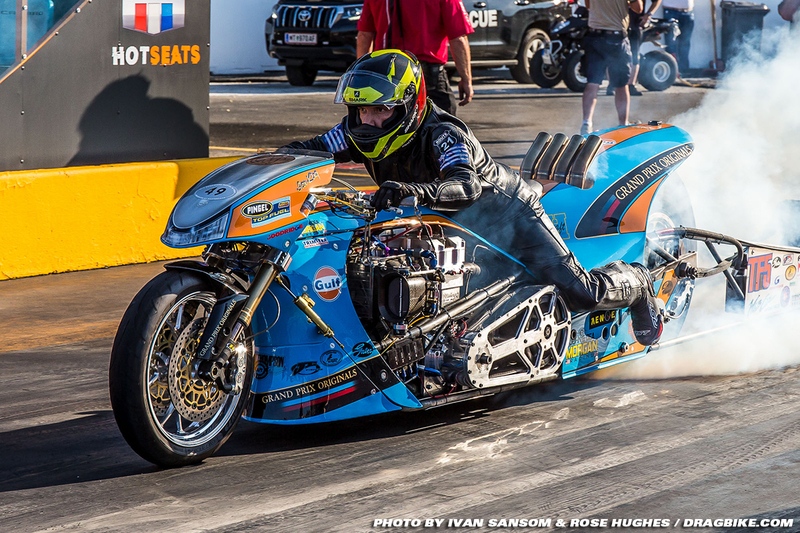 I hope that this clears up some of the commonly held misconceptions about running a supercharged 1500 HP 4 cylinder Top Fuel Bike engined machine. From our experience at the track over the decades, I can assert that they require lower maintenance and less replacement parts than the majority of the other `Professional’ automotive racing classes.